The over easy eggs, crispy bacon, sausage and whole grain toast arrived at our table and my mom, carefully and with her hands shaking with Parkinson’s-induced tremors, began cutting at an egg to start her meal. As she ate, I noticed something that my sister warned me about. My mom started methodically, painstakingly, repeatedly scraping the plate to pull the yolk into one specific place. Over and over and over and over. Repeating the same motion on the plate. I choked back tears. My sister told me that she had developed moderate Obsessive-Compulsive Disorder as part of the aging process. She told me that my mom would hoard and neatly fold toilet paper and tissue (which she did), that she’d organize her crayons and pens over and over (which she also did) and that this was just part of this stage of life. But something about the way she managed this plate of food just broke my heart. The challenges that certain diseases create are really staggering and sad. She looked up from her plate, smiled a wide, toothy smile, and let out a laugh as she thanked me and said how good the meal was! The high and lows are something. One thing I noticed multiple times over as I wheeled and walked my mom around Tucson is how poorly designed the world is for people with disabilities. I knew this growing up with brothers and sisters who were blind or in wheelchairs, but it isn’t part of my regular life as an adult. Getting her wheelchair into and out of certain places was a real challenge. The ADA ramps sometimes don’t lead to anywhere useful and even little steps into buildings present major obstacles. Even small things like finding a place to store her chair while we ate proved a little challenging at times. One wonderful upside, though, was how delightful every single service professional was at the hotel, the restaurants, and even the stores we’d went in. I watched as clerks and servers looked at my mom with the same tenderness as if they were looking at an elderly loved one in their own lives. I noticed this and was grateful. As breakfast concluded we began a ritual that must be mentally exhausting on a full-time basis: taking her meds. My mom’s morning pills range in size from super tiny to “horse pill” large and there were 15 distinct pills. She couldn’t take them all at once and I had to make sure she took them all, so I bent down next to her and slowly handed her a couple at a time, waiting and holding my breath a little that she didn’t choke as she swallowed. I imagined what it must be like to separate each of those pills for three meal times every day from 15 different bottles and prescriptions and keeping track of drug interactions. I’ve got some friends who are In Home Healthcare providers and I know how poorly we fund and support that work. Seeing this glimpse into how much is involved was really something. As I write this, one thing I want to be clear about is that this story is not unique and my actions don’t get close to worthy of any praise. There are people – overwhelmingly women – who care for ailing parents on a full time basis. Every day, every night. They miss work. They balance caring for children and managing their own staff at work and squeezing in time for their own needs. Our failure as a society to better support our seniors is not just a senior care issue, it is an economic issue, a woman’s issue (occasionally a man’s issue, to be sure), and an inter-generational challenge that we have to grapple with. For me, in this weekend with my 85-year old mom, I got a glimpse into the mental strength necessary to be there for an ailing parent. I am grateful to have been in a position to do it even for just a weekend. I am grateful that my sister and her husband are close enough to be there for her on a regular basis. 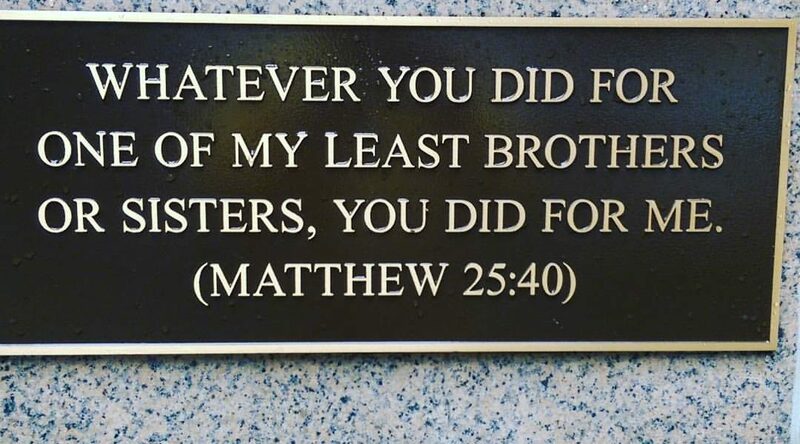 But thinking about my mom and the small amount of social security she receives makes me think about the growing homeless senior population in our country and what they do for medical support, for emotional support, for basic shelter. How they deal with being frail or with being clean as issues of incontinence begin to creep in. We are on the cusp of a reckoning not just in my hometown of San Diego, but across the country. Phyllis Passons changed the course of my life with her love. She deserves every bit of my being that I can give. And I wish we as a society would do better in honoring our seniors, regardless of whether we think they saved enough or planned in a way someone thinks they ought to have. 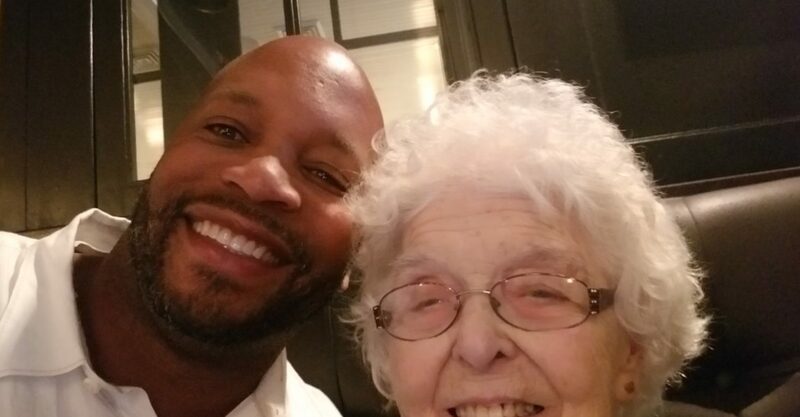 I was lucky to have the time that we shared, both to return some of the love she spent a lifetime giving to me and for the window into the many challenges our seniors and those with disabilities face. If you haven’t read part I of this series, please read that here. My foster/adoptive parents were much older than most parents because they started foster care after their own children were grown. When my mother broke her hip a few years ago, I witnessed firsthand how fragmented and difficult our system of care for senior citizens in the San Diego region can be. As a poor senior on a fixed income, my mother found it difficult to identify and access supportive services, and had to rely on her children’s help. But what about seniors without family close by? 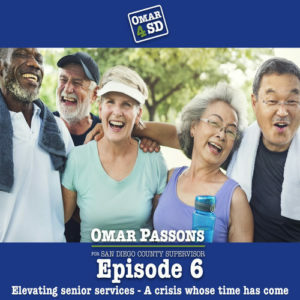 In this episode, I discuss ways that our region can and should increase focus on senior care and housing affordability issues. I touch on elements of the domains of livability that senior advocacy organizations have identified as critical to providing for a dignified life in one’s later years, and point to solutions that can better advance the care and inclusion of our senior population. 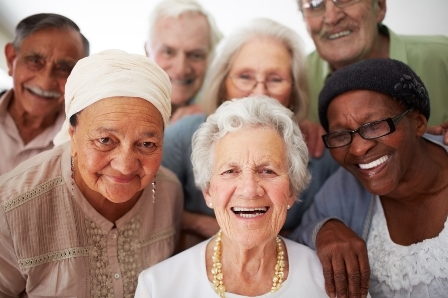 The County of San Diego runs an Office of Aging and Independence Services that administers programs and services primarily funded from federal and state sources, but I think it can and should do more. 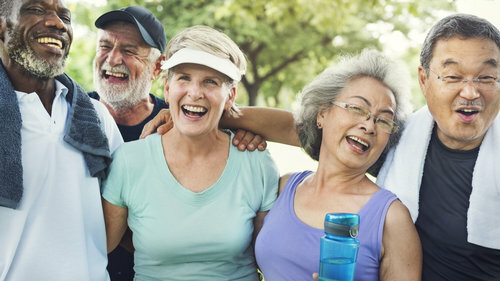 The critical takeaway is that our population is aging and, with limited incomes and crushing housing costs, we run the risk of creating a wave of severely challenged older adults that have significant and prolonged impacts on our region’s economic and social well-being. San Diego County has seen a spike in homelessness among our senior citizens and we have not done enough to raise the priority and visibility of this critical need. By some research accounts, senior citizens make up the fastest growing proportion of San Diego’s homeless individuals in recent years. This Voice of San Diego article helps highlight some of the challenges. The data for our region makes clear that the County must act. The truth about our existing – and growing – crisis among seniors for healthcare, housing, transportation, and even basic food security is that this is a serious problem for all of us, regardless of income. Seniors in failing health are disproportionately cared for by their female children – compounding the challenges women face while trying to close a persistent wage gap and, often, maintain primary responsibilities for children. The issue is also especially acute for members of the LGBTQ community, as our government policies long made it illegal to even have children – which places greater strain on individuals and peer networks. The challenges are significant but help exists. St. Paul’s Senior Services runs the Program of All-inclusive Care for the Elderly (PACE) is exactly the type of comprehensive senior support that makes a huge difference. The challenge is that we have not sounded the alarm regarding scaling our support for such programs. PACE is funded by state MediCal coverage – which is health coverage for poor residents. I took a tour of St. Paul’s to make sure I had a firsthand appreciation of the issues. As San Diegans look to shoring up our fraying and unstable safety net in the county, elevating system supports like this one will become critical. An important step in the process is making sure more people understand the crisis we are in so we can build the will now to address it. That’s exactly what I am pushing to do. Thanks for reading.